PHILADELPHIA, March 29, 1992 -- As President Bush left his home this morning for a Sunday walk around Lafayette Park, his unsolicited question echoed the ones asked by all the others who have ever been captivated by a basketball, two hoops and the wondrous things that can happen in between. "Did you see the ending of the Duke game ?" the President asked. How many others were asking the same question ? How many others were sharing and savoring the frantic, imperfect brilliance that had driven Duke and Kentucky to the highest level of the game ? How many others, beyond the 17,878 privileged witnesses inside the Spectrum on Saturday night, will one day claim they were there ? From opposite ends of the Spectrum came an overwhelming realization as soon as Duke's 104-103 overtime triumph over Kentucky in the East regional championship game was won by Grant Hill's 75-foot-plus pass and Christian Laettner's 17-foot buzzer-beater. There was evidence all around that the final, stunning 2.1 second climax -- and the passionate two and a half hours that built to the decisive basket -- belonged among the most gripping moments of theater in the 54-year history of the tournament; and for that matter, in the century since James Naismith came up with a very good idea. Driven by their belief in their skills, their ability to make quick, complex decisions and their desperate effort to extend a season, the Blue Devils and the Wildcats created a succession of remarkable plays under the most stressful circumstances. The two teams combined to make 61 percent of their shots from the field. In the final 25 minutes of the game -- the second half and overtime -- as each possession took on an even greater importance, the players from Duke and Kentucky defied the certainty that one team's season was about to end by shooting a combined 63.2 percent. 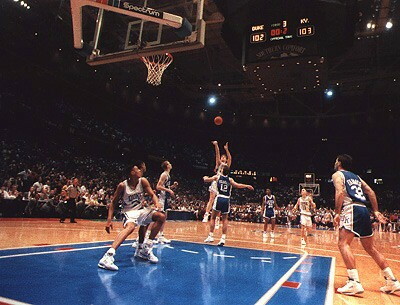 Laettner's final shot, a more complicated reprise of a last-second overtime shot he made to beat Connecticut and advance Duke to the 1990 Final Four, put the Blue Devils (32-2) in a national semifinal against Indiana next Saturday night. 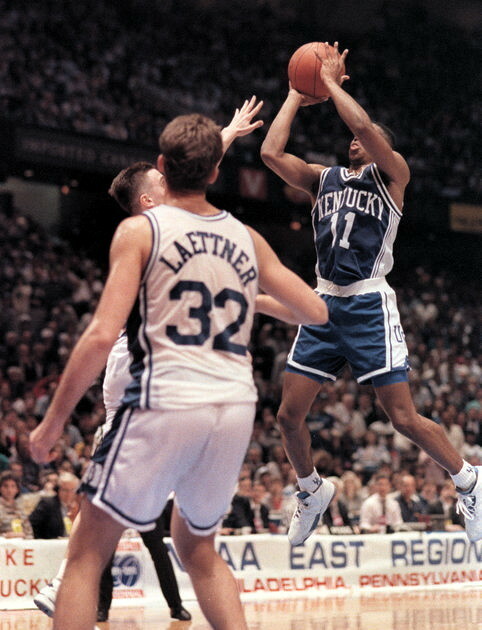 The shot was Laettner's 10th in 10 attempts from the field and his second in in the last 31.5 seconds. He also made 10 of 10 fouls shots, 4 of them in he final 1 minute 53 seconds. Laettner's only imperfect moment on the evening was when he intentionally stepped on Kentucky freshman Aminu Timberlake, drawing a technical foul. But the statistics only provide part of the evidence to place this game with the most well played in tournament history. The sense of drama elevated the game among North Carolina's 1957 triple-overtime survival of Kansas and Wilt Chamberlain, and the Tar Heels' 1982 1-point victory over Georgetown and freshman Patrick Ewing on a shot by another freshman named Michael Jordan. And North Carolina State's 1974 double-overtime, come-from-behind victory over U.C.L.A. in a national semi-final that ended the historic Bruin streak of seven national championships. And the U.C.L.A. 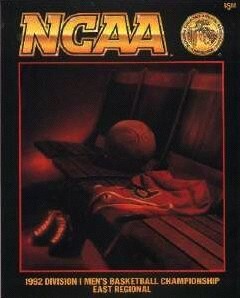 overtime victory over Louisville one year later that led to a 10th championship in John Wooden's final season as coach. And North Carolina State's last-second upset of Houston on Lorenzo Charles' dunk of Derek Whittenburg's airball in 1983. And Villanova's near-perfect championship game against Georgetown and Ewing in 1985, in which the Wildcats made a record 78.6 percent of their shots. Or Duke's cathartic national semi-final victory over Nevada-Las Vegas last spring. In the final minutes, during a stop in play, the evidence could be found in the upraised eyebrows of Tim Higgins, a normally impassive official. Before Kentucky's last possession, there was the quick thinking of Duke guard Bobby Hurley. "Bobby was saying, 'If they score, remember to call a time out,'" Duke coach Mike Krzyzewski said. "I didn't say it, he said it." And when exactly that happened, when a bold 13-foot, right-handed push by Sean Woods barely made it over Laettner's outstretched arm, kissed the glass and caromed into the basket, the Blue Devils were 2.1 seconds and a length of the court away from where they needed to be. All they had left was themselves, and the carefully presented conviction of their coach. "I just said, 'We're going to win,' " Krzyzewski remembered. "Whether you completely believe it or not, you have to have the expression on your face and the words in your mouth that we're going to get a good shot to win." Suddenly a pass and a shot cut through the noise to create a roar. Woods was on the floor, face down, motionless, a white pom-pon resting on the back of his legs. Some Blue Devils piled on each other; others just wandered around the floor. In an interview area, Kentucky coach Rick Pitino explained his decision not to place a defender against Hill's pass by erroneously saying that the play began from the sideline rather than the baseline. When he realized his mistake, Pitino apologized, thought for a moment and said, "My mind is elsewhere right now." He asked that a question be directed toward players Richie Farmer and Jamal Mashburn. "My mind is in a total fog right now," Pitino admitted. Pitino pressed his eyes closed and held two fingers over the bridge of his note. Kentucky's pain was just beginning to set in. Inside the dressing room, where players sat in street clothes and stared ahead, John Pelphrey was asked if he would discuss what his team had achieved. "I'd like to," Pelphrey began to say, before the words stopped coming and he had to turn away. Down the corridor, where the Blue Devils dressed, Hurley said, "I can't speak for any other game in the past, but this is the best game I've ever been a part of in my life." Better than the defeat of U.N.L.V. ? "What the U.N.L.V. game stands for is us beating a team that was almost unbeatable," Hurley said. "So that, on a larger scale, counted a little bit more. But this game, as far as playing the game itself, was a lot greater feeling, a lot more satisfying to me." Krzyzewski said, "I thank God I was a part of it."